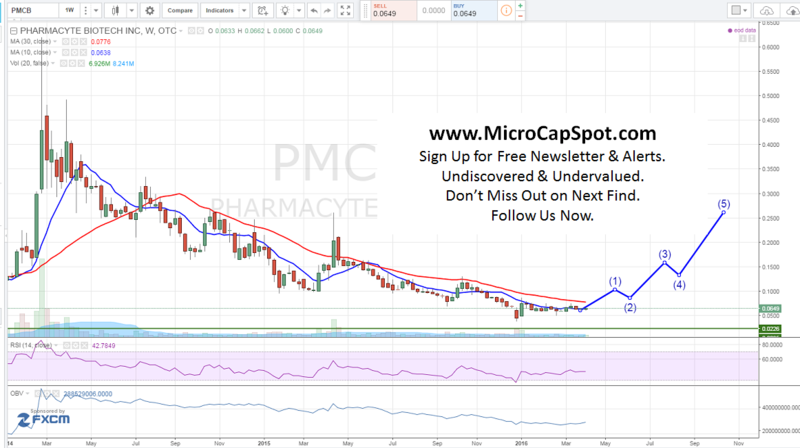 Pharmacyte Biotech Inc (OTCMKTS:PMCB) closed at an intra-day high on breaking news that its encapsulation facility for pancreatic cancer therapy was deemed suitable by the Thai FDA. This is a very bullish development. The stock has climbed past its highs set in mid-March of $0.074 and current trading at $0.077. It has developed a higher high and poised for more gains from current levels and should easily climb higher from current levels. On April 6th PMCB announced it has changed its clinical trial design. This means that the actual date for the clinical trial is unknown at this point. While the new trial design offers PMCB a much better shot at success with FDA and EMA approval, it has also been an exercise in patience for the company’s leadership and its shareholders. PMCB just released its financial information with the SEC according to a recent filing. PMCB is set to launch a new clinical trial sometime in 2016 for pancreatic cancer patients. There is a huge unmet medical need and people will welcome a solution that could potentially increase the lifespan for late stage pancreatic patients. If the clinical trial is successful, PMCB will be gaining more than just 50% to investors and likely cause the company to increase in value significantly and potentially be acquired by a larger pharmaceutical company. Any positive results would move PMCB into the spotlight and above other early stage biotechs who are trying to come up with a solution as well. There would be a substantial increase in the company’s value and it would absolutely be able to attract major attention from large pharmaceutical companies. It would give a much needed viable option for pancreatic cancer treatment. The market size for pancreatic cancer is huge. Looking only at major developed countries, the market size should reach close to $3 billion within the next 5 years. If we look at the addressable market that in the United States only is equally impressive, which PMCB should easily be able to attain. A typical drug price for this disease is roughly between $50k and $75k per year. There are about 43,000 patients diagnosed with pancreatic cancer a year. Assuming that 60% of the patient pool would switch to PMCBs drug, the market size in the USA could be estimated at $1.25 billion to $1.8 billion. Given the market valuation is only $51 million, a successful positive trail will send shares flying through the stratosphere. PMCB is currently trading at a $64 million market valuation. PMCB is developing a revolutionary therapy that could provide relief to thousands of patients every year that are diagnosed. There is a huge market that PMCB will be able to successfully operate in if clinical trials yield positive results. Even though a fully FDA approved drug is likely a long way out, advances and positive news will send shares flying. Stay tuned for more updates. We will be updating on PMCB when more details emerge so make sure you are subscribed to Microcapspot so you know what’s going on with PMCB . Disclosure: we hold no position in PMCB either long or short and we have not been compensated for this article. 800 Commerce Inc (OTCMKTS:ETHG) Undergoing a Transformation?